CHARLIE Wants to Charm YOU! 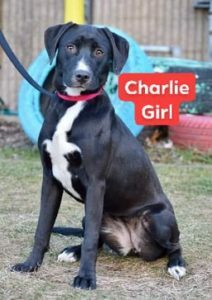 SHE is a 9 month old bubbly Lab mix pup with a slim build. CHARLIE is good with other dogs & older kids (because of her “bubbliness”). CHARLIE Girl is hoping to become a member of a loving family. This entry was posted in 6 to 12 Months, Adopted, Adopted Dogs, Dog Center, Dogs, Female. Bookmark the permalink.